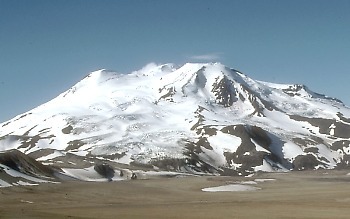 Mount Mageik volcano viewed from the Valley of Ten Thousand Smokes, Katmai National Park and Preserve, Alaska. Mageik's broad summit consists of at least four separate structures built above different vents. Credit: R. McGimsey / U.S. Geological Survey . A stratovolcano is a steep, conical volcano built by the eruption of viscous lava flows, tephra, and pyroclastic flows. Usually constructed over a period of tens to hundreds of thousands of years, stratovolcanoes may erupt a variety of magma types, including basalt, andesite, dacite, and rhyolite. All but basalt commonly generate highly explosive eruptions. A stratovolcano typically consists of many separate vents, some of which may have erupted cinder cones and domes on the volcano's flanks. A synonym is composite cone. Of Earth's 1,511 volcanoes known to have erupted in the past 10,000 years, 699 are stratovolcanoes. Earth's highest volcano is a stratovolcano; Nevado Ojos del Salado in Chile is 6,887 meters above sea level. The highest volcano with historic eruptions is Llullaillaco, Chile, at 6,739 meters. Both volcanoes are located in the northern Chilean Andes. Mount St. Helens is the youngest stratovolcano in the Cascades and the most active. Geologists have identified at least 35 layers of tephra erupted by the volcano in the past 3,500 years. Mount Shasta is the largest stratovolcano in the Cascades.